We know that by providing the care and direction seniors need, by building trust and creating connections – we can truly create better lives for them and their families. Amada Senior Care, premier provider of non-medical in-home care and assisted living placement counseling, recently opened a new office in the greater Phoenix area – their Mesa, Arizona location. 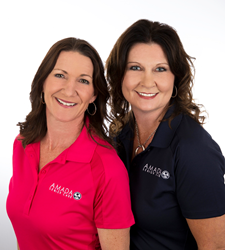 Amada franchise partners Kris Patmos and Kimberly Perkins decided to make the move to senior care with their purchase of the rights to the area after years of experience in the sales and healthcare industries. Their grand opening will be held on Thursday, July 2nd. When asked what makes Amada different from other homecare companies, Kim said that Amada Mesa not only understands the impact that quality care can have on a senior and their family – they understand the healthcare landscape in general and are here to guide seniors through it. The grand opening of Amada Senior Care Greater Mesa will take place on Thursday, July 2nd. The office is currently looking for qualified full and part-time caregivers to work with their clients. For more information, you can visit their website at http://www.AmadaSeniorCare.com/Mesa or call 480-999-5253.